Do you know of a bridge with water flowing underneath it, even if it is ever so slowly? 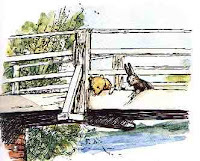 If you have small children (or maybe even if you don’t) you really must play Poohsticks. How do you play? Everyone finds one small piece of something that will float (twigs, leaves, pine cones, etc). It is best if the pieces are easily recognizable and distinguishable from each other. Each person places his or her wrist on the same side of the bridge, holding the object with their fingers. At the same moment everyone releases their object. 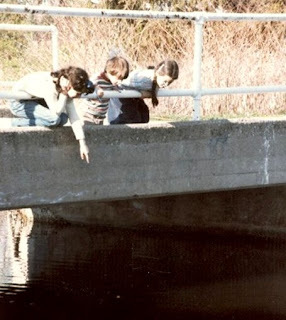 There is then a scurry of little feet as everyone rushes to the other side of the bridge and peers down to see if they can see their object coming out from under the bridge. The first to come out is the winner. If your family is like our family, you will probably end up playing many rounds, and will play it every time you encounter a serviceable bridge. I think it makes it especially nice if your family has read the book together or at least the relevant excerpt. One day, when Pooh bear was just walking along the bridge with a fir cone in his paw, in his own world, not looking where he was going (probably thinking about honey), he tripped over something. This made the fir-cone jerk out of his paw into the river. And he went back for some more fir-cones. It did. It kept on doing it. Then he dropped two in at once, and leant over the bridge to see which of them would come out first; and one of them did; but as they were both the same size, he didn't know if it was the one which he wanted to win, or the other one. So the next time he dropped one big one and one little one, and the big one came out first, which was what he had said it would do, and the little one came out last, which was what he had said it would do, so he had won twice ... and then he went home for tea.